​​I like cats, I really do! But every time I bring up the fact that outdoor cats can harm wildlife, it seems to stir up all sorts of emotions in cat owners that let their cats outdoors. Cats CAN harm wildlife, and we get lots of cases of wildlife that have been very critically injured by cats, dogs too, but usually cats. 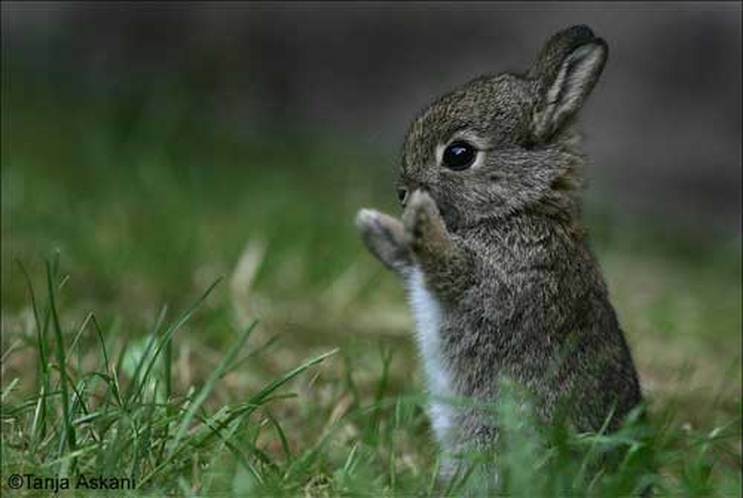 Imagine a healthy baby bunny, in good condition, with no broken bones, but with its skin taken off most of its body after its been “toyed with” by a cat. I’m sorry for that image! But that’s what we get and there’s nothing we can do except to humanely euthanize the animal. FromThe New York Times 1/29/13, That Cuddly Kitten is Much Deadlier than you Think. Cats kill billions of wild animals every year and represent a serious ecological threat to our environments. They kill more native animals that any other human related cause, such as car collisions and pesticide consumption, and are considered greatest human-linked threat to wildlife in the US. Cats kill enough prey to leave our native wildlife, such as fox, hawks, raccoons, skunks, opossums, etc... hungry and less able to survive. Diseases from cats have been found to put native wildlife in danger. Marine Mammals have started dying from the parasite causing toxoplasmosis that found its way into the oceans from cat poop left on land. On the other side-of-the-coin, there are many perils waiting for our pet cats outdoors, and many end up in hospitals every year injured and sick from being hit by cars or after catching diseases from wildlife. Recent projects like "Kitty Cams" conducted by the University of Georgia attached cameras to the collars of indoor-outdoor pet cats to track their activities, and found cats not only preying on native wildlife, they also showed cats lapping up antifreeze and sewer sludge, dodging under moving cars and sparring violently with much bigger dogs. Cats were first domesticated in Egypt around 2000BC. 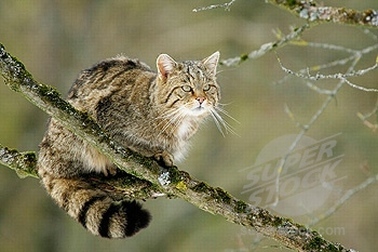 Felis silvestris is not native to the Americas. House cats are a human-introduced predatory species that disrupt nature's balance. From Google Images. 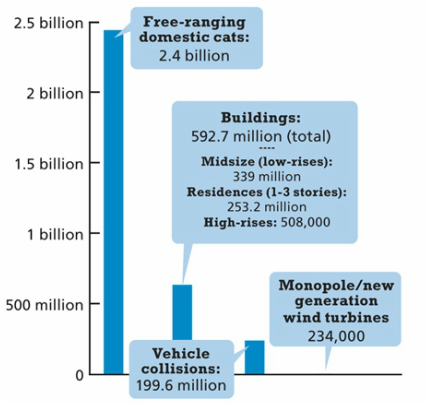 Census data and include only those cats that people claim to “own” as pets, NOT cats that are semi-wild or free-ranging. In most areas, the person who provides care for a cat is legally responsible fir its welfare and control. 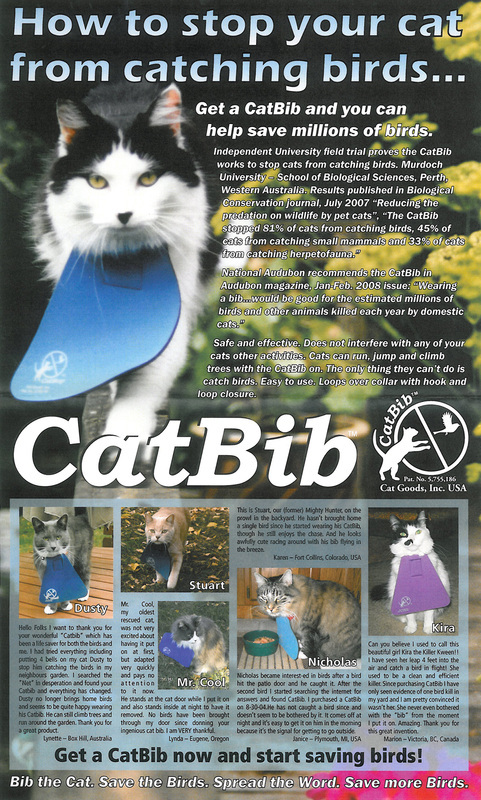 As with other domestic animals, if ownership can be established by collars or other means of identification, a cat is considered personal property. It is usually the responsibility of the owner to control the cat’s movements. Outdoor cats can bring fleas, ticks, diseases and parasites into the home, exposing owners to multiple diseases. How do cats affect wildlife? 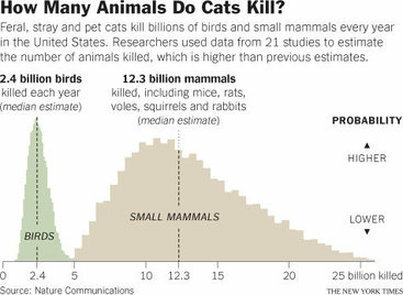 Observations of free-ranging domestic cats show that some individuals can kill over 1000 wild animals per year, many of these are rare and endangered songbirds and mammals. 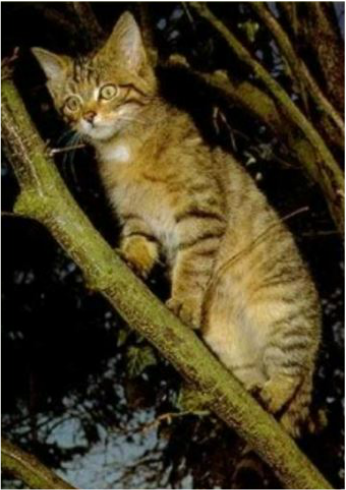 Domestic cats impact the populations of over 250 species of threatened or near threatened birds worldwide. A well fed house cat will STILL hunt if let outdoors. Not all house cats eat the prey that they take. And most cats do NOT bring home a lot of their dead prey, which means that they may be killing more wild animals than an owner may realize. Not only do cat prey on many small mammals and birds, but cats can outnumber and compete with native predators. Domestic cats eat many of the same animals that native predators do. When present in large numbers, cats can reduce the availability of prey for native predators, such as hawks, owls, falcons, foxes, coyotes, mink and weasels. Free ranging domestic cats may also transmit new diseases to wild animals. Domestic cats have spread feline leukemia virus to mountain lions and may have recently infected the endangered Florida Panther with feline panleukepenia (feline distemper) and an immune deficiency disease. New evidence shows that marine mammals are dying from the parasite that causes toxoplasmosis. This parasite come from cat feces on land that rains wash into the oceans. All of these diseases pose serious threats to wildlife and are pushing rare species closer to extinction. 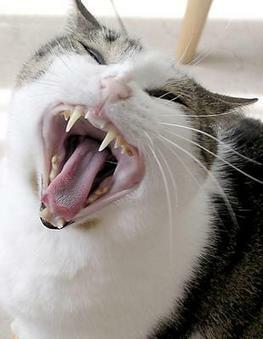 A cat's sharp teeth can easily puncture the organs of a small animal. The bacteria in a cat's mouth may proove deadly even days after an animal is bitten. From Google Images. Being a good neighbor means have the courtesy not to impose your pets on other people. Consider talking with your neighbors if you keep your cat outdoors. 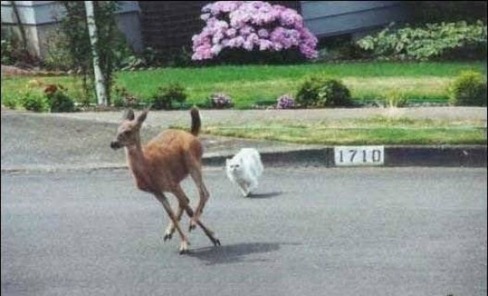 Many people do not like cats threatening their wildlife, their pets & children, or defecating in their gardens. Consider fencing in an area of your yard for your cat or other pets, or supervising them while they are outdoors. 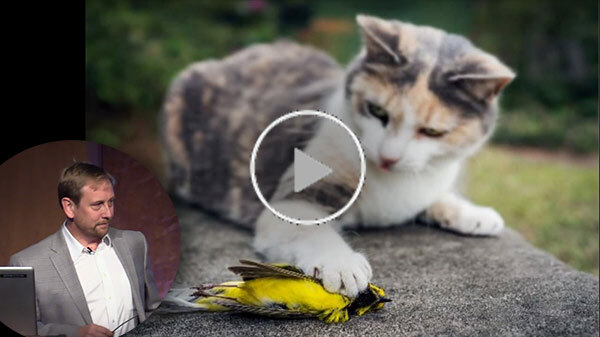 Peter Marra, head of the Smithsonian Migratory Bird Center, talks about the threats free-ranging cats pose to biodiversity and public health throughout the world, and proposes possible solutions to this thorny problem. What perils await your pet cat outdoors? Cats can be hit by vehicles - thousands of cats are killed by vehicles each year. Cats can be attacked or chased by dogs, predators such as coyotes or raccoons, and even other cats. This can result in bad injuries, such as torn ears, scratched eyes, abscesses, internal injuries, diseases, and sometimes, death. Outdoor cats are more likely to contract numerous diseases such as feline leukemia or immunodeficiency viruses, they can also become infected with fleas, ticks and other parasites. They can be poisoned by pesticides, antifreeze, or by eating rats or mice that have died from rat poison. Cats can also get sick from eating garbage or other contaminated morsels. Many cats are injured when, seeking warmth, they crawl under car hoods and are killed or maimed when the car is restarted. Image courtesy of Amusing Time. 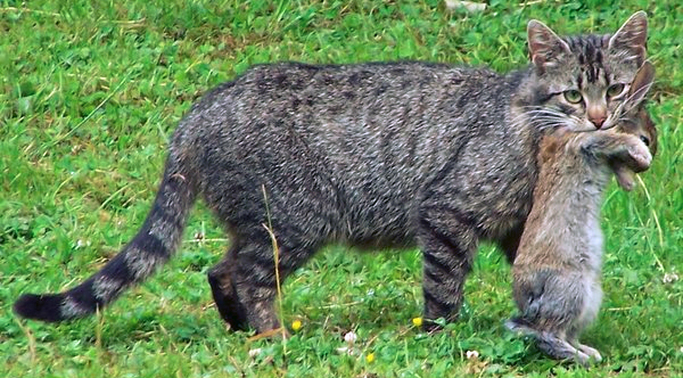 Free-ranging cats are abundant and widespread predators. They often exist at much higher densities than native predators. 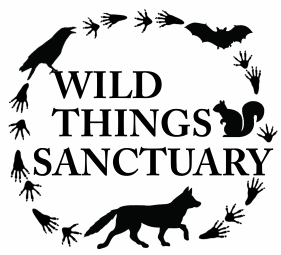 They prey on large numbers of wild animals, some of which are rare or endangered. They compete with native predators, and they harbor a variety of diseases. Keeping a cat fed does NOT reduce their desire to hunt. Yet, cats are popular pets. In order to have and care for out pets—and still protect our native wildlife—we must make an effort to limit in a humane manner the adverse effects that free-ranging cats can have on wildlife. There are also more perils outdoors than many pet owners realize, so consider all of the above information when making decisions about your pet cat. The number of birds killed each year by human activities. From Discover, November 2014. If cats must be allowed outdoors, consider using a fenced enclosure of runway. The Indoor Cat Initiative offers great suggestions on how to keep your cat happy indoors. Don't turn your cat into a killer and disrupt nature's balance by letting it outside. From Google Images. Declawing may reduce hunting success, but many declawed cats are still effective predators. Did you know that even by chasing wildlife, cats and dogs can harm an animal? A stressed animal can go into shock, which may lead to death. From Goggle Images. Don’t feed stray cats. Feeding strays maintains high densities of cats that kill and compete with native wildlife populations. 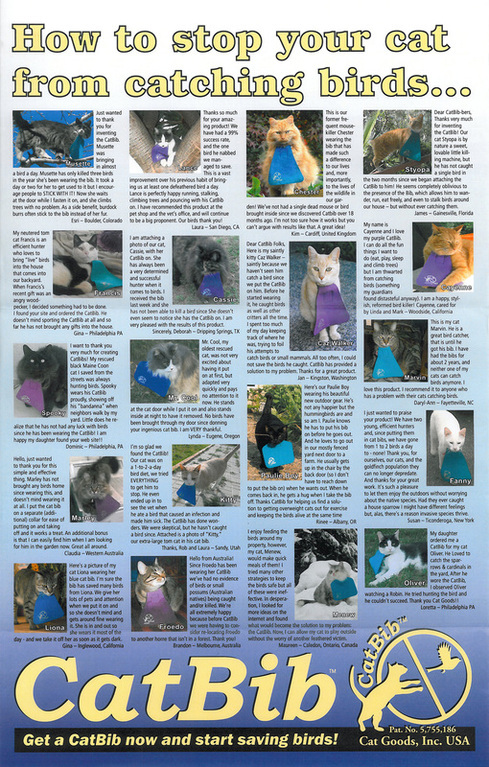 Spay and neuter your cats to prevent them from breeding, and encourage others to do the same. On farms, keep only the minimum number of free-ranging cats needs to control rodents. Well-fed, neutered cats will stay closest to farm buildings and do most of their killing where rodent control is needed the most. Enjoy and protect the nature that surrounds you!